I’ve got a history of collecting close girlfriends. I guess I just get along really well with other women. I’ve been the maid/matron of honor in four weddings in as many years, and as a result I’ve hosted my fair share of showers. 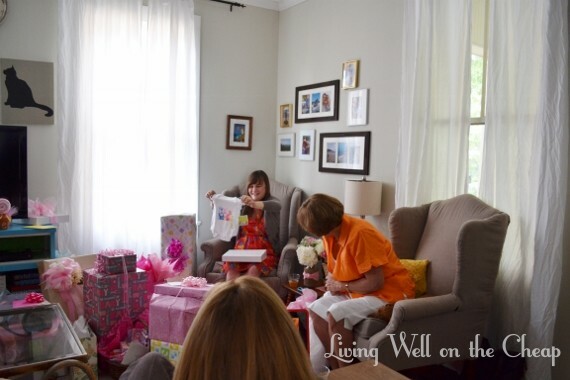 This weekend I hosted my first ever baby shower, and I dare say it was my best yet. 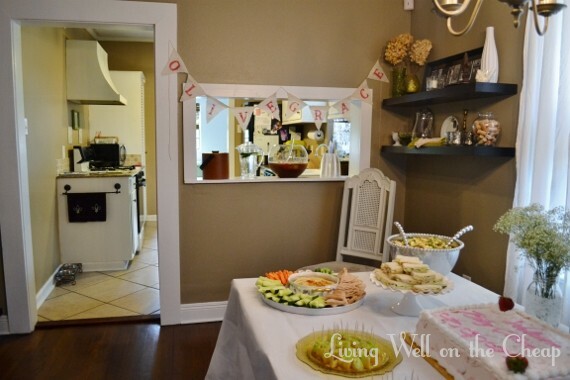 Every other shower I’ve ever hosted has been just me and maybe 1-2 other people, but having four hostesses for this shower really made such a difference! I wasn’t nearly as stressed as I normally am and we were able to do more (many hands make the work light and all that). 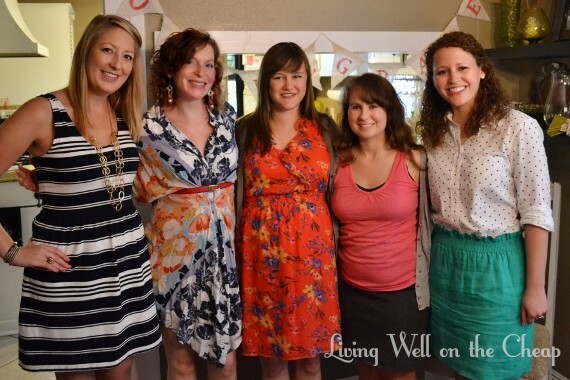 From left to right: Jen, Tarah, Cassie (the guest of honor), me, and Amanda. 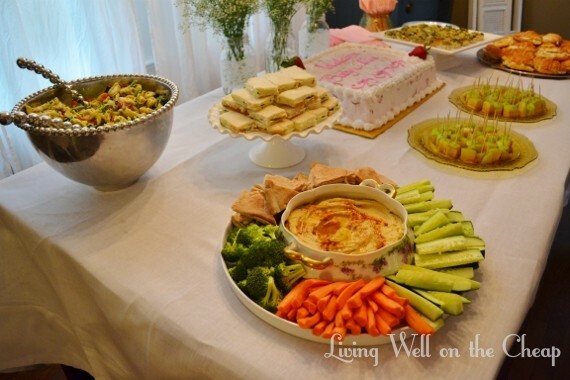 Over the years I’ve slowly developed a standard shower menu: cucumber sandwiches, strawberry cake from Ambrosia Bakery, chicken salad served on croissants (this time we got them from Calvin’s Market but my mom swears by Sam’s chicken salad), hummus with pita wedges and vegetable spears, and my signature tea punch. We also served caramel apple bites, spinach pastry puffs, and this pasta salad that’s definitely getting added to my menu in the future (Jen made it and it was crazy delicious)! Tarah brought over vintage dishes that belonged to her grandparents to mix in with more modern pieces. It was a really sweet touch, especially since Tarah and Cassie met working together in a vintage boutique years ago. Amanda got the flowers at Whole Foods and arranged them herself in mason jars that she already had. We got lots of compliments on them, and after the shower we sent them home with Cassie, her mom, and each other. I kept a really pretty bouquet of pink roses to give to my mom for Mother’s Day. We set up a drinks station in the kitchen pass-through with punch and cucumber infused water. I had this punch at a shower years ago and I emailed the hostess afterwards to get the recipe. At the time I didn’t even like tea, but this stuff is delicious! Even Nick likes it. I’ll share the recipe at the end of this post. None of us are into cheesy shower games, but this one was so darkly funny that we couldn’t resist. I got a bag of plastic king cake babies from a local party supply store (I think there were about 30 in the $2 bag) and froze them in ice cubes. We distributed the cubes to everyone’s drinks and the first person whose melted was to shout,”My water broke!” Cassie’s nephew won, haha. He said he was going to give the tulips he received as a prize to his mom for Mother’s Day. 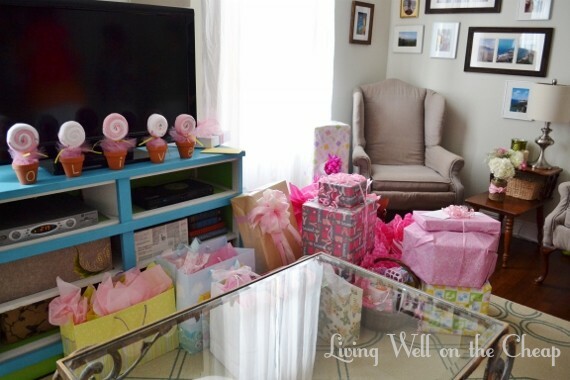 We set up the gifts in a corner of the living room (so glad I finally finished reupholstering that chair!). Do you see those cute little lollipop flower looking things? Tarah made them from washcloths and baby spoons! She says she saw it on Pinterest. 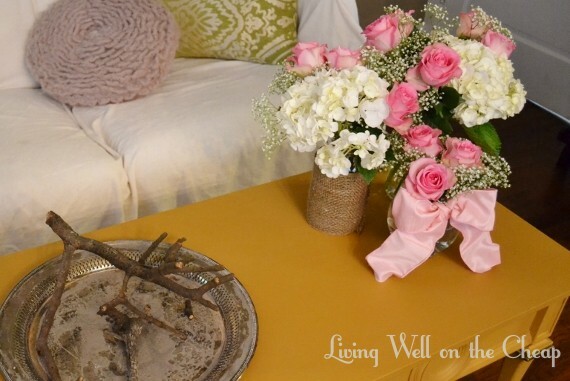 I love it when decorations can be repurposed as a practical gift for the guest of honor. Yes, there are cats on that onesie. Hilarious, especially if you know how Cassie is about her cats. How beautiful is this handmade afghan? I want one for myself! And just as a note, I was worried about having enough seating for everybody but it worked out just fine. A couple of ladies squeezed onto the bench in our entryway, folks dragged chairs in from the dining room, and here you can see three girls seated comfortably on the chaise lounge. I’m soooo glad I got that secondhand Ikea chaise instead of a loveseat. It’s definitely much more practical. You can also see Amanda and her mom perched on ottomans in this photo. I was totally worried for no reason. Overall, it was a great party and such a wonderful way to honor my dear friend. 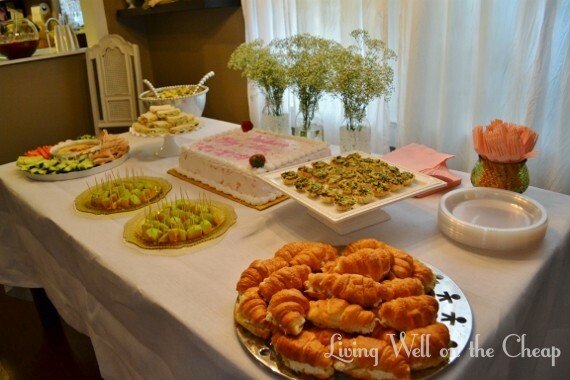 All of the guests were so sweet. It truly was a joy. I’m feeling much more confident now about hosting Jack’s birthday party next month, even though I won’t have my team of hostesses! Fill a mini bunt pan (or any other container well-suited to the purpose, such as concentric tupperware bowls with a weight in the middle) with fresh fruit and mint leaves. I like to use chopped strawberries and pineapple. Fill with gingerale and freeze overnight. Bring to a boil and remove from heat, let steep. While it’s still warm, remove the tea and mint leaves and add the sugar, stirring until it’s dissolved. Pour tea into punch bowl and fruit juices and remaining gingerale. Taste and add additional water if too sweet. I’m so glad she got the kitty onesie! I was planning on passing along the 9 month one I have to Olive! 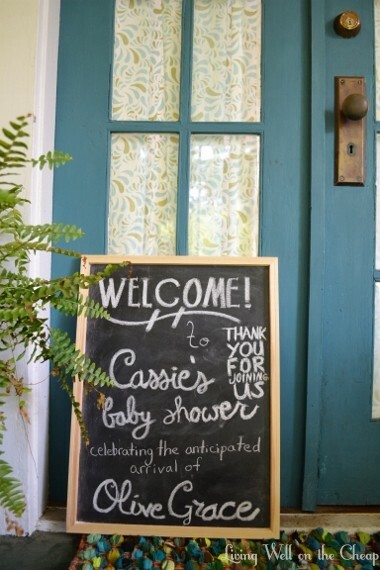 Charlotte, the shower was wonderful! It was so much fun seeing everyone. Everything was so perfect and the decorations were beautiful & creative. I have such great friends to put such a special event together. what size bottles of ginger ale for this recipe?